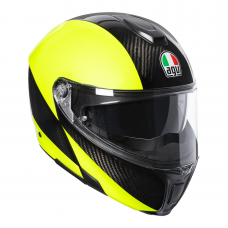 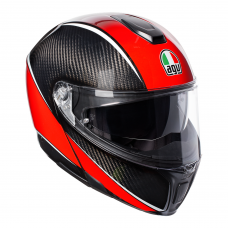 New for 2018 - introducing the AGV Sport Modular, a full face flip front motorcycle helmet with no compromise on weight, performance or safety. 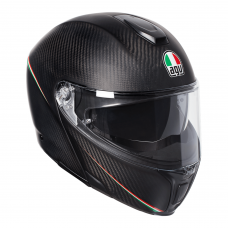 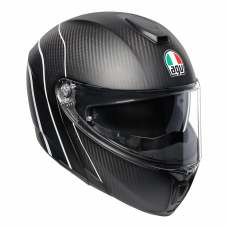 The Sport Modular is the first 100% carbon fiber flip-up helmet, giving it a classing leading weight of just 1295g and the performance and safety of our Pista GP-R helmets. 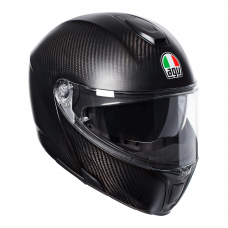 This helmet really does give you the best of both worlds – it behaves like a modular and performs like a full-face. 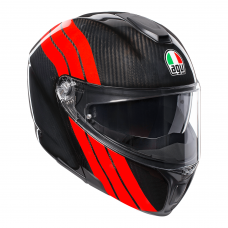 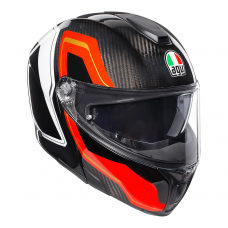 We’ve packed the AGV Sport Modular to the brim with features – this helmet boasts a 190 degree horizontal field of view, a rear lip profile that directs rain and spray away from the neck, plus advanced technical fabrics. This includes a water-resistant outside to block moisture seepage, fast-wicking lining materials for moisture control and a smooth fit, plus our patented ventilation-enhancing reversible lining, one with a silky-smooth Ritmo cool side and a soft Shalimar warm side. 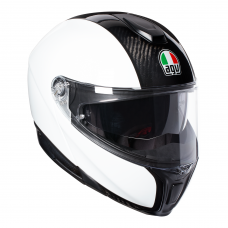 Simply flip to suit the weather.